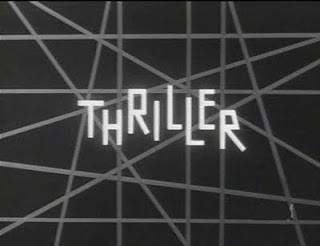 A Thriller a Day...: It's a Thriller! Okay, we know what you're thinking. Well, technically we don't, but if you're poking around this blog, there's a good chance you already know who we are, and what we're up to. So why, you ask? It gives us an excuse to banter back and forth on a daily basis, which isn't as easy as it may seem when one of us is in California and the other is jet-setting back and forth between Arizona and London. 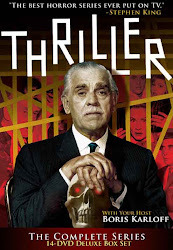 With the legitimate release of Boris Karloff's Thriller on DVD, we thought it would be a fun excuse to sit down and watch the entire series, one episode a day, for as long as it takes, or until one of us can't take it anymore. Heck, we each paid almost $100 for the set, so we'd better watch them (lest you think this is some sort of gimmick that landed us free review copies - no such luck!). We invite you along for the ride - please feel free to post your comments to the blog to let us know if we totally missed the boat on a particular episode (or if one of us did, since we have a hunch that we won't see eye to eye on every episode). And if you really want to get into the spirit, follow along at home and post your comments as we go! Wow? How can you listen to the opinion of a man whose entire living room is devoted to one single book? Does this sound like someone who's hinged? Do you know that John's wife has to set the table with OMEGA MEN plates and LAST MAN ON EARTH napkins? I won't even talk about the Star Wars stuff...yet. Ever the comedian. That's Omega Man, BTW. Someone's liable to get excited searching the web for a fan of the DC Comics series. And for the record, she doesn't seem to mind the life size Will Smith in the theater, so it's a small price to pay. Thanks for posting, Michael. We hope you'll continue to share your thoughts as we make our way through the series! I just want to say this blog is such an awesome idea. As essential for a fan of Thriller as any of the commentaries and special features in the DVD set. The humor alone is vital when grinding out some of the flatlines in this series. Like a support group wearing t-shirts that read: "I Survived The First Five Episodes." I got hip to Thriller through David Schow. As this is my first exposure to the show, I have to admit it's great to finally see what always seemed like a best kept secret among the Monster Kids. A great opportunity to discuss what will undoubtedly be great episodes...eventually.